Ao Dai is considered as a traditional costume in Vietnam and the beauty of Vietnamese women. 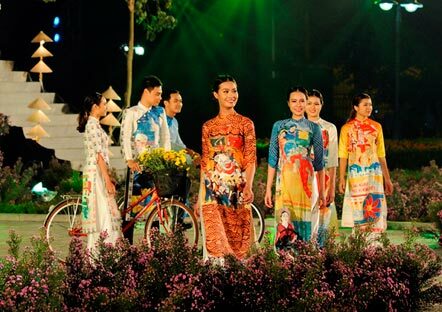 Ao Dai becomes a ‘tourism ambassador’ to promote Vietnam tourism and Vietnam culture. From a ‘cultural ambassador’, the Vietnamese tourism sector is making efforts to make the Ao Dai into a ‘tourism ambassador’. The image of Ao Dai has been used to promote the beauty of Vietnamese culture. In addition, the long dress has become a tourism product. For example, when visiting the ancient town of Hoi An in the central province of Quang Nam, after learning about silk and the Ao Dai, many visitors want to have their own dress made; therefore, tailor services appeared. Tourists only have to pay a deposit and select the fabric as well as leave their body measurements and hotel address for tailors, after which they will quickly receive a beautiful set of Ao Dai right the very same day. In Ho Chi Minh City, designer Si Hoang has built the Viet Nam Ao Dai Museum with a total area of 16,000 square metres, featuring the history of Ao Dai culture through hundreds of patterns. At the museum, sets of Ao Dai are displayed on a background of traditional wooden houses, leaving a deep impression on all visitors. On display are sets of Ao Dai of special women in the country’s history including the first woman general of Viet Nam People’s Army Nguyen Thi Dinh, former Vice President Nguyen Thi Binh and diplomat Ton Nu Thi Ninh. The use of the Ao Dai in tourism development has been promoted methodically and synchronously in recent times; therefore, in mid-October, the Ha Noi municipal People’s Committee held the 2016 Ao Dai Festival. Director of Ha Noi Department of Tourism Do Dinh Hong said that the traditional costume of each country embraces the cultural quintessence and contributes to tourists wanting to discover the culture of the host country. He emphasised that the Ha Noi Ao Dai Festival not only aimed to honour the nation’s traditional dress but also acted as a bridge connecting foreign tourists with Viet Nam, towards building Ha Noi into a fashion centre with Ao Dai considered as its centre. With a wide range of shows, experience activities, displays and parades, the festival featured the participation of 32 designers and attracted more than 30,000 visitors. The biggest concern of the public is how to promote the beauty of Ao Dai in order to develop tourism. At the seminar on ‘Preserving and promoting the traditional value of Ao Dai in tourism’ on the sidelines of the festival, researchers, designers and entrepreneurs agreed that first it is essential to enhance the popularity of Ao Dai in the community. However, nowadays, women only wear Ao Dai on special holidays, at Tet and to weddings because they face inconvenience in daily activities, particularly in current modern life. 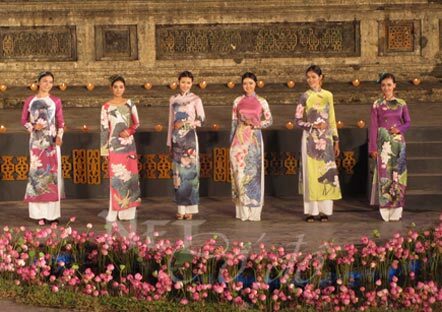 Deputy Director of Viettrans Travel Company Nguyen Tien Dat proposed that designers should create renovated Ao Dai patterns that are suitable for different contexts. He also shared that the authorities should encourage citizens to wear Ao Dai more frequently. For example, the image of people wearing Ao Dai and organisation of Ao Dai fashion shows are expected to become an attraction for the pedestrian streets around Hoan Kiem Lake in Ha Noi. The festival offered an opportunity for Ha Noi to build policies to promote the tourism value of Ao Dai such as building more destinations and tours related to Ao Dai and universalizing the popularity of Ao Dai, added Deputy Director Do Dinh Hong. Currently, several designers in the capital are ready to organise homestay service for visitors who are interested in Ao Dai, considering as the first steps in the process of promoting the value of Ao Dai to develop tourism.